Omar came and went during the very early hours of Thursday the 16th. How hard did it blow? Not very. This delicate flower blossom drifted down to the palm frond that evening. The tree above was in bloom with many blossoms still in evidence. Our new Beneteau Cycladies 43, COOL GIRL, and our IC24, LITTLE GIRL at rest in the lagoon. Papaya trees, not know as being very durable, fell down during the storm. 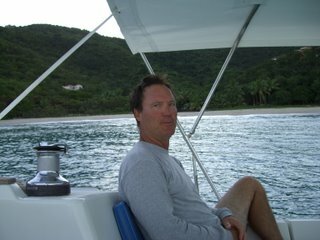 Norm left this morning for Tortola, which has been bracing for a direct hit from hurricane Omar, expected early Thursday am. Here's the storm track from Wunderground. Omar is a Category 3 Hurricane, packing winds of 125mph. As of 7am this morning, the core of Omar had just passed the BVI, and is heading north-northeastward. Reports from Antigua indicate very severe lightning, high winds, and heavy rain. Warnings are issues for mudslides and flash floods. Report from Anguilla says Omar has passed, winds were not too bad, 60kt max, with debris and downed trees, and power out as of now. Report from St. Kitts also says no power, lots of wind and waves, and the lightning. Coastal damage, power lines down, trees down, debris. No current reports from St. Croix, which looked like it was directly in the path. Based on hurricane watchers' reports on Storm Carib. Rob is waiting for Norm to arrive, and they expect to have a lot of work unwinding the hurricane preparations for the fleet. Hopefully, Nanny Cay will weather the expected storm surge of 4-6ft, and the boats will not suffer damage. 9-13 October 2008 aboard Melissa. The Crew: Tom at Weepecket Island after a swim. Elizabeth before her swim at the Weepecket anchorage. Chris using the lead line, "Dunker Plongee," off Kettle Cove on Naushon Island. A week ahead of the course's start date, the weather looked awful! In New England, things can change. Change they did... we had the most pleasant cruise, gentle winds, warm days and chilly nights illuminated by a nearly full moon shining through a clear sky. Stunning. MELISSA, at the dock in Menemsha. Our neighbor, Bob, on his Tartan Ten, "Fiddlin in the Wind" came over for dinner. Elizabeth's famous flounder pie with several side dishes, Bob's jug of wine, and a few hours of great story telling completed a fine night. The next evening, we were alongside Bob at the Black Dog Wharf where we dined ashore at the restaurant. More stories... Cruising adventures. The beach at Weepecket. The tiny figure on the beach is Christopher. Rugged fellow... he swam ashore to explore. Vineyard Haven images. Not visible are Bob of Fiddlin, Elizabeth of Melissa, and Charlene Douglas of Mac Nab jamming with violins at the end of the pier. Music as the sun set. The Douglas' sloop, Mac Nab is out on the harbor undergoing engine repairs and testing. Bob and Charlene were prepping for their end of season cruise. Bob's T-10 at Menemsha. The T-10 is a Sparkman and Stephens design modeled after the Aphrodite 101. Averisera and Fiddlin must find time to rendevous next season. Melissa at rest in Boston. Three years ago Norm and Elizabeth did a CPM on Melissa. Norm was the skipper. Elizabeth was finishing the last of her sailing courses. It was a terrific trip with many memories and good meals. No one will ever forget the storm as we departed New Bedford, the surprise mussels platter crew-member Wil arranged for Elizabeth, or watching the Patriots on TV at the Aqua Grille... October CPMs are special for us. An October cruise last year on Averisera was special for all the same reasons. All be it a bit more private! For 2008, Elizabeth and Norm team up again on Melissa. Now, Elizabeth is leading students, sharing her knowledge. MELISSA: The scene for "our first date." AVERISERA: What happens when older sailors... sail. Averisera at the Black Dog Docks in Vineyard Haven. We must get a nice image of Melissa here, too. Better yet... Melissa and Averisera alongside one another at the dock. Romantic, eh?